To get a good crop of sweet, juicy citrus fruit, the plants need enough to eat. Citrus trees (Citrus spp.) require relatively high levels of nitrogen, as well as phosphorus and several micronutrients, in order to thrive. Citrus are hardy in U.S. Department of Agriculture plant hardiness zones 9 through 11, and can be grown indoors in other zones. The plants grown indoors need a slightly different fertilization schedule than outdoor trees. Oranges grow on a tree branch. The simplest way to fertilize a citrus tree is to use specially formulated citrus fertilizers. Citrus trees require the nitrogen (N), phosphorus (P) and potassium (K) typically found in plant foods, as well as micronutrients like sulfur, iron, boron, magnesium, manganese and copper. The phosphorus requirements of citrus trees are low, so a good citrus fertilizer will have a nitrogen- and potassium-heavy N-P-K ratio such as 13-7-13. 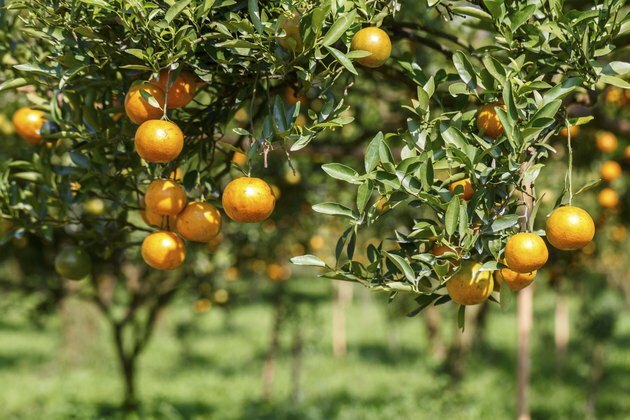 A granular, slow-release citrus fertilizer with this N-P-K ratio would be applied at a rate of 1/2 ounce per square foot under mature, outdoor trees every three months during the growing season. Citrus fertilizers also include micronutrients, though the specific nutrients vary depending on the manufacturer. To regulate citrus nutrients more closely, nutrient requirements can be calculated based on the age and condition of the tree. For new, outdoor trees, mix 1-3/4 cups of phosphate fertilizer into the soil at planting time. Additional phosphorus is only required every three to four years by applying 1 pound per tree, and working the phosphorus into the top 1 inch of soil. Citrus trees require yearly nitrogen. A tree that is one to three years old requires 1/4 to 1/2 pound actual nitrogen per year. Using blood meal, which contains 5 percent nitrogen, this would be a total of 10 to 15 pounds of fertilizer. Ammonium sulfate has 21 percent nitrogen, so you'd need 2-1/3 to 3-1/2 pounds of fertilizer. By the time a citrus tree is five to six years old, most require 1-1/4 to 1-1/2 pounds of actual nitrogen each year. The exception is grapefruit (Citrus x paradise), hardy in USDA zones 9 through 11, which requires half this much fertilizer once it is mature, according to the University of Arizona. Begin fertilizing outdoor citrus trees early in the year, during January or February. If using specially formulated citrus fertilizer, continue to apply according to label directions. If you calculated the nutritional requirements for individual trees, divide the required amount of nitrogen by 3 and apply one-third in January and February, one-third in April and May and one-third in August and September. Required micronutrients may be present in the soil, but keep an eye on the tree for signs of micronutrient deficiency. Yellowing or pale green foliage with bright green veins can be a sign of magnesium, iron or zinc deficiencies. This can be corrected by spraying micronutrients on the foliage. For example, mixing 1 to 2 tablespoon Epsom salts with 1 gallon of water and spraying the mixture on the leaves supplies magnesium. The nutritional needs of potted, indoor citrus are the same as for citrus grown outdoors. Both need regular feedings of nitrogen and micronutrients. The amount of fertilizer to apply is what differs. Use a commercially available, slow-release plant food designed for use with indoor plants, preferably a citrus fertilizer or an all-purpose plant food that contains micronutrients such as iron, magnesium, zinc and boron. For a citrus food with an N-P-K ratio of 5-2-6, use 1 teaspoon of fertilizer for every 4 inches of pot diameter, and mix into the soil. Double this ratio for pots over 12 inches in diameter. Apply fertilizer three times a year in January-February, May-June and September-October.